Another year, another chance to change history - Support Rotary's Charitable Projects. The Foundation is a nonprofit 501c3 corporation, with assets of $3.55 million. The Foundation is a not-for-profit organization that is supported solely by voluntary contributions from members of the Rotary Club of Chicago and friends of the Foundation. 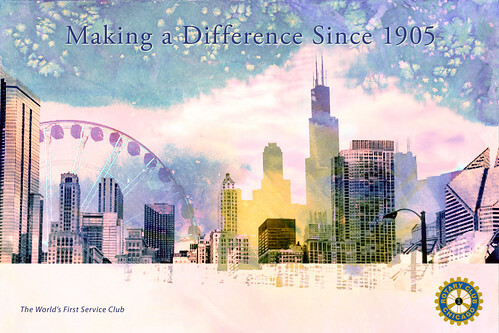 They share the commitment to service that began in 1905 with the founding of the Rotary Club of Chicago – the Worlds' first service club. life-saving or life-altering surgery for children with congenital abnormalities. The ROTARY/One Foundation has committed over $250,000 for the 2018-2019 Service projects of the Rotary Club of Chicago. With other grants and project donations the club will complete over $200,000 in projects this year. Contributions to the ROTARY/One Foundation are tax-deductible within the limitations of the law and provide opportunities for both Rotarians and friends of the R/O Foundation to support the service projects of the Rotary Club of Chicago. Individuals can support the Foundation through contributions of cash, securities, or property. People who have access to matching giving programs are encouraged to use those to maximize their contribution. In addition, the Foundation’s Legacy Award is given to individuals who commit to bequest $25,000 or more to the ROTARY/One Foundation in their will. A gift made in a person’s will is deductible from the estate in computing federal and Illinois estate taxes. Donations may also be made at any time in recognition of an individual or event, or as a memorial to a loved one, friend, or colleague. Women of Rotary Scholarship Fund - Prior to women being invited to join Rotary the wives of the members of the Club formed the Women of Rotary Foundation. They raised a lot of money yearly through events to support the causes they felt important which among them were scholarships and the children outpatient clinic and free care fund at Rehabilitation Institute of Chicago. Today the funds principal is preserved and annual earnings used for college awards to support students from Chicago. While the Foundation conducts an Annual Drive each autumn, donations are accepted throughout the year. Donations may be made by credit card or check. Additionally, special efforts are made to seek support for the ROTARY/One JOB1 Summer Internship Program. For further information about how you can support the service projects of the Rotary Club of Chicago through donations to the ROTARY/One Foundation, please contact the Rotary office at (312) 372-3900 or Office@RotaryOne.Club. You can also make donations by clicking on Donations.